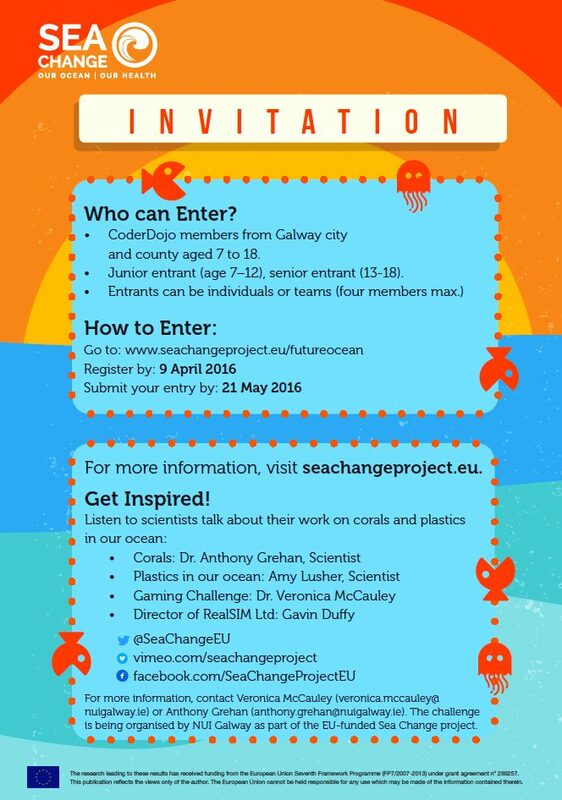 Sea Change is an EU H2020 funded project that aims to establish a fundamental “Sea Change” in the way European citizens view their relationship with the sea, by empowering them, as Ocean Literate citizens, to take direct and sustainable action towards a healthy ocean, healthy communities and ultimately a healthy planet. By using the concept of Ocean Literacy, Sea Change will create a deeper understanding amongst European citizens of how their health depends on the health of our seas and ocean. Sea Change will move to bring about real actions using behavioral and social change methodologies. Building upon the latest social research on citizen and stakeholder attitudes, perceptions and values, the Sea Change partnership will design and implement mobilization activities focused on education, community, governance actors and directly targeted at citizens. These actions will be assessed for their effectiveness which, in turn, will allow the project to improve its techniques and spread a “Sea Change” in behaviour across Europe. 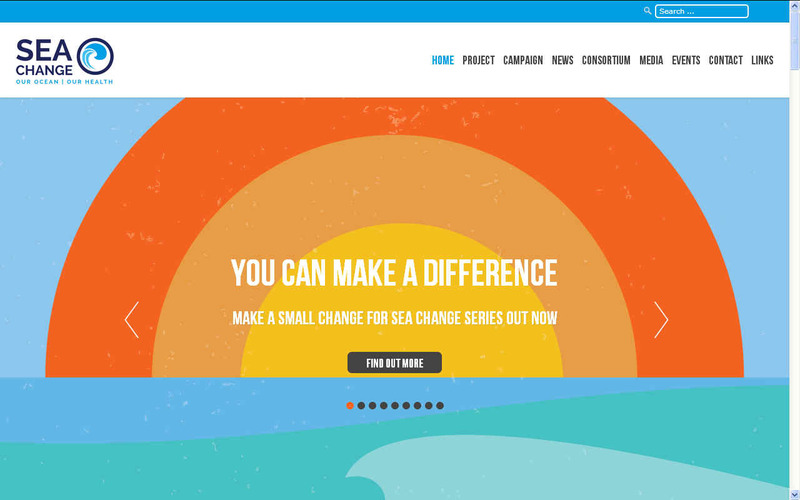 The Sea Change project aims to establish a fundamental “Sea Change” in the way European citizens view their relationship with the sea, by empowering them, as Ocean Literate citizens, to take direct and sustainable action towards a healthy ocean and seas, healthy communities and ultimately a healthy planet. Compile an in-depth review of the links between Seas and Ocean and Human health based on latest research knowledge outputs. Build upon the latest social research on citizen and stakeholder attitudes, perceptions and values to help design and implement successful mobilization activities focused on education, community, governance actors and directly targeted at citizens. Build upon significant work to date, adopting best practice and embedding Ocean Literacy across established strategic initiatives and networks in order to help maximise impact and ensure sustainability. Ensure that efforts to sustain an Ocean Literate society in Europe continue beyond the life of Sea Change through codes of good practice, public campaigns and other ongoing community activities. Ensure that all activities of Sea Change are carefully monitored and evaluated to ensure maximum sustainability, effectiveness and efficiency. Ensure Knowledge exchange with transatlantic partners to bring about a global approach to protecting the planet’s shared seas and ocean. The objectives will be achieved by a closely interlinked programme. Sea Change includes a mobilisation phase engaging with citizens, formal education and policy actors. Crucially, the legacy of Sea Change, including continuing knowledge sharing with North America, are embedded within the project. The Sea Change project objectives will be achieved by a closely interlinked programme. Sea Change will firstly create a resource containing standardised knowledge relating to the links between the planet's seas and ocean and human health. This information will be disseminated to raise awareness and communicated through targeted campaigns tailored for key stakeholder groups. Dialogues will be carried out with policy makers on seas and ocean health and consultations and engagement activities will ensure mutual learning between the project partners and target stakeholders. Existing relevant programmes and initiatives from European Member States and North America (e.g. 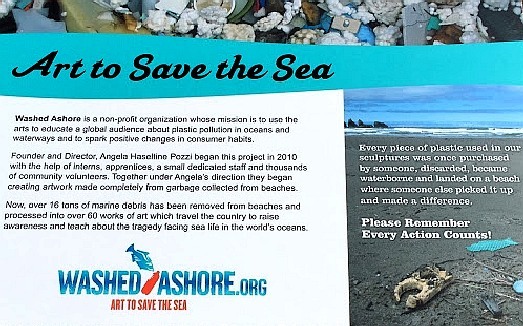 Ocean Literacy campaigns; One World, One Ocean, World Ocean Day, etc.) will be linked through complementary networking and coordination activities. Sea Change includes a mobilisation phase which will engage with schools, citizens, decision makers and industry representatives with the idea that we ALL share one ocean – and that this ocean is fragile. Crucially the legacy of Sea Change, including continuing knowledge sharing with North America, is embedded within the project. 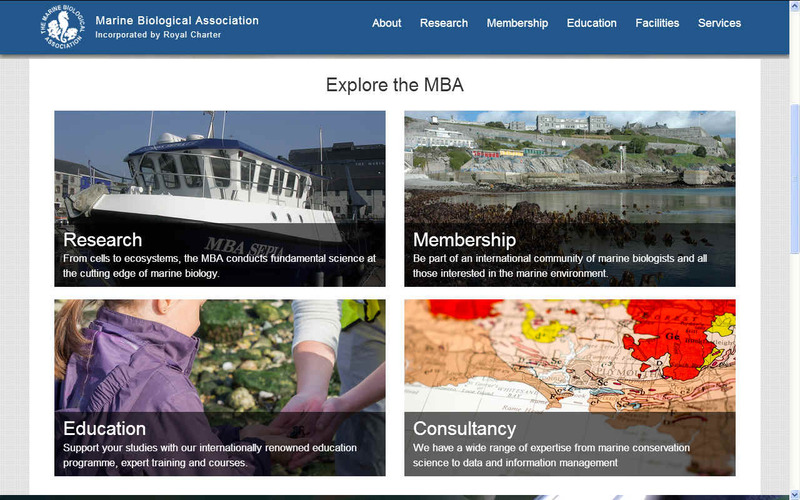 MBA - The Marine Biological Association conducts, promotes and supports scientific research into all aspects of life in the sea. They work with an growing membership to provide a clear and independent voice on behalf of the marine biological community. As well as making a fundamental impact on our understanding of the natural world, MBA outputs have made positive contributions towards impacts on people, societies, their health and well-being, and the planet. The targets identified to be reached indirectly will be achieved through a major public awareness campaign under WP7. This campaign will link with networks, associations and key stakeholders to act as ‘multipliers’ of the Sea Change message in the longer term. influence and frame messages during mobilisation activities (WP3, 4, 5), and roll out the campaign. The campaign will be implemented by all partners; including the members of the partner networks (WON, Ecsite etc.) which will multiply impact as the campaign will thus reach thousands of visitors at associated aquaria, science centres and museums. In order to support the ecosystem approach and contribute to the objectives of the MSFD (Impact 2), Sea Change will encourage stakeholders to recognise that humans are part of the ecosystem and that our activities both affect the ecosystem and depend on it. The project will endeavour to foster behaviour and attitude changes in order to encourage citizens to become responsible actors of change and to use the ecosystem approach to make decisions in order to manage their activities sustainably. Sea Change will bring together a powerful collection of change agents who will collaborate and cooperate to leverage their unique insights and experience to add value, act interdependently, share knowledge and build trust in innovative, scaled-up ideas and solutions to social challenges. Due to their broad geographical coverage and active cooperation, the science centres, museums and aquaria that constitute Sea Change are ideal collaborators for ensuring significant impact of the project outcomes. An example of the multiplying role of network members is their involvement in the scaling up of the best pilot projects from WP 3, 4 & 5. Sea Change will create an extended network of “Sea Change agents” empowered through WP2 to help bring about the desired “Sea Change”. Sea Change has been designed to include dedicated work packages focusing on impact measurement (WP8) and ensuring a Sea Change legacy beyond the funded project duration (WP6), which will also promote the setting up of new networks to support Ocean Health - building upon the collaboration and analysis of the activities developed as pilot activities in WPs 3, 4 and 5. Educate and engage a wide range of audiences – from scientists to sailors and pupils to policy-makers – not only on the vital importance of a healthy Ocean to the health of humanity, but on their role in maintaining ocean health into the future through simple everyday actions and leave a legacy of awareness and care for the most important resource on this planet – The Sea. 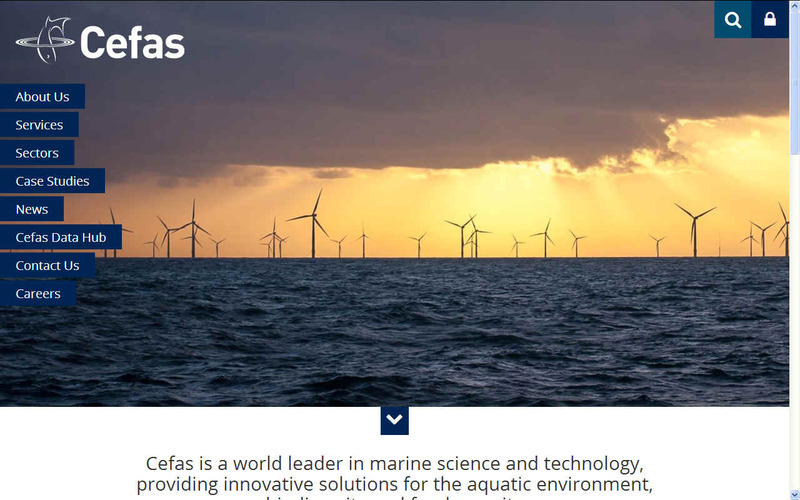 CEFAS - Cefas can provide a broad, multi-disciplinary and multi-sectoral understanding of marine science, maritime industries, public and stakeholder engagement and works closely at the science–policy interface. This experience is based on organisational ‘memory’, stretching over a hundred years, combined with state-of-the-art technological developments and continuing research applied to a range of topics of clear relevance to the European citizen. Examples include food security (sustainable fisheries & aquaculture), ocean health and seafood safety (viruses, bacteria, HABs toxins), habitat protection (Marine Protected Area, and Marine Conservation Zones, trawling, dredging, aggregate extraction, offshore renewables), the impacts of climate change (ocean acidification, species migrations, wave climate), the effects of chemical and radioactive contaminants and marine litter. Experience of participation in many previous European projects, including as Coordinator and Work Package leads (e.g. in relevant projects such as KNOWSEAS). Cefas acted as WP lead for the public perception part of the FP7 project CLAMER (www.clamer.eu), which helped inspire this specific call. NATIONAL UNIVERSITY IRELAND - The National University of Ireland (NUI), Galway is the largest and oldest university based in the west of Ireland, employing in excess of 2,000 staff with a 17,000 strong student population. 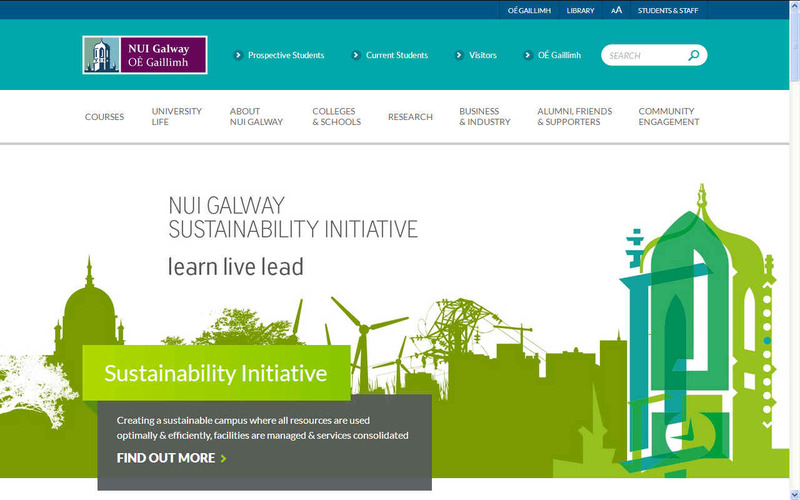 NUI Galway is a research-led University and has an overall ranking of 284th in the QS world university rankings for 2013 and 314 in the Times Higher Education world rankings for 2013/2014. Over the past ten years the University has heavily invested (excess of €400 million) in its research & teaching infrastructure. In 2013, University income exceeded €220 million of which over €50 million was from externally funded research with funding sources including and to-date has secured in excess of €40 million from FP7 including ERC, Marie Curie, Cooperation, Capacities programmes. The University was recently awarded the REA’s “HR Excellence in Research” designation identifying NUI Galway as a provider of a high standard working environment for researchers. 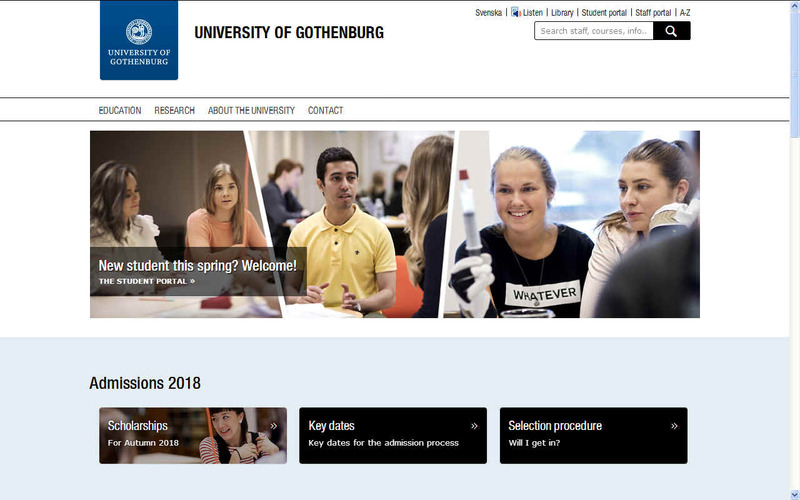 UNIVERSITY OF GOTHENBURG - The Faculty of Education comprises research that focuses on issues such as learning and teaching among children, young people and adults, the impact of digital technology on our learning processes and how well grades can actually predict future success with studying. Researchers also work with issues such as sustainable development and schools’ organisation and educational planning. The Department of Education, Communication and Learning’s fields of knowledge include issues to do with learning, teaching, communication and identity among children, young people and adults. This includes an interest in people’s meaning-making and knowledge development in everyday life, as well as in institutional and professional contexts. The department also offers courses within the teacher-training programme and is a pioneer in ocean literacy in Europe as one of institutes co-founding the European Marine Science Educators Association (EMSEA). The department has expertise in creating and disseminating pedagogical resources on marine and environmental education. The department works closely collaboration with the department of biological and environmental sciences having a strong focus on marine environmental issues. 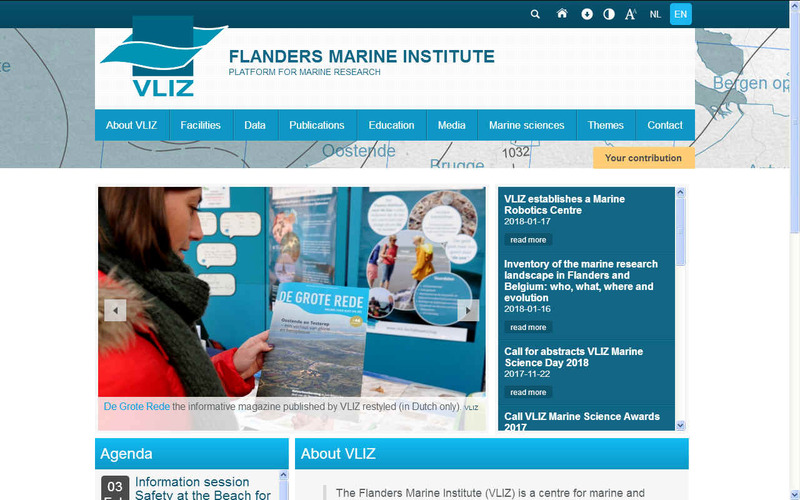 FLANDERS MARINE INSTITUTE - Established in 1999, the Flanders Marine Institute (VLIZ, Belgium) is the central coordination and information platform for marine and coastal scientific research in Flanders. VLIZ is a focal point for marine and coastal-related research and serves as an international point of contact in this respect. VLIZ is a government funded but autonomous institute with the legal status of a non-profit organisation. The institute does not conduct research, but performs scientific support tasks for the more than 1000 marine scientists in Flanders. This includes oceanographic data management, logistic assistance, ICT support and web services, the management of a marine library, coordination and networking tasks, and the provision of a wide range of marine information to various target groups. Its strategic objectives are to promote coastal and marine scientific research, to increase its visibility to the public at large by means of popularisation and sensitization, and to provide scientific information on the ocean, the seas and the coasts to policy makers. 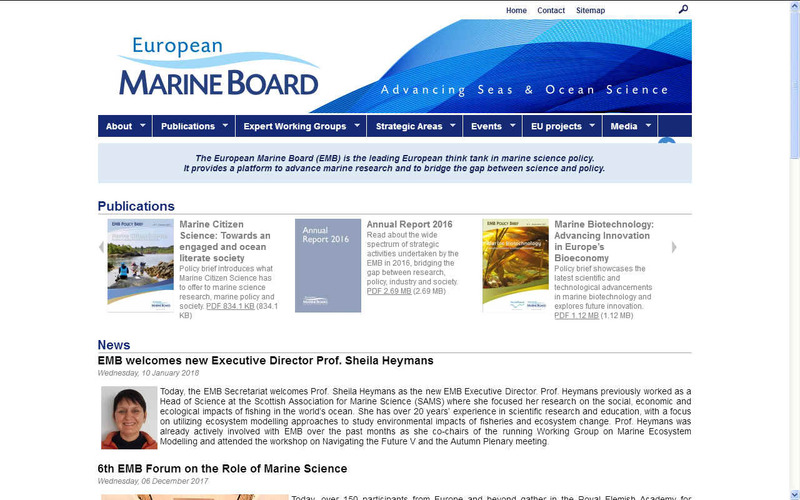 EUROPEAN MARINE BOARD - The European Marine Board provides a pan-European platform for its member organizations to develop common priorities, to advance marine research, and to bridge the gap between science and policy in order to meet future marine science challenges and opportunities. The aims of EMB are to ‘facilitate enhanced cooperation between European organizations involved in marine science towards the development of a common vision on the research priorities and strategies for marine science in Europe. The Board provides the essential components for transferring knowledge from the scientific community to decision makers, promoting Europe’s leadership in marine research and technology. 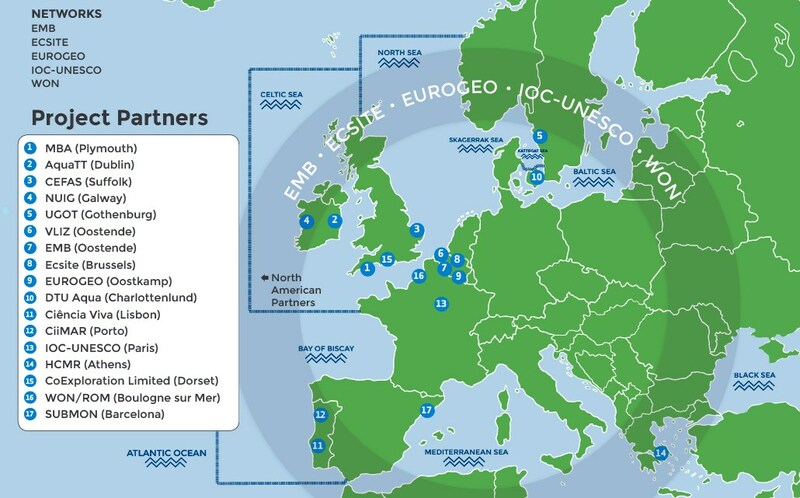 Adopting a strategic role, the European Marine Board serves its member organizations by providing a unique forum within which marine research policy advice to national agencies and to the European Commission is developed, with the objective of promoting the establishment of the European marine Research Area. 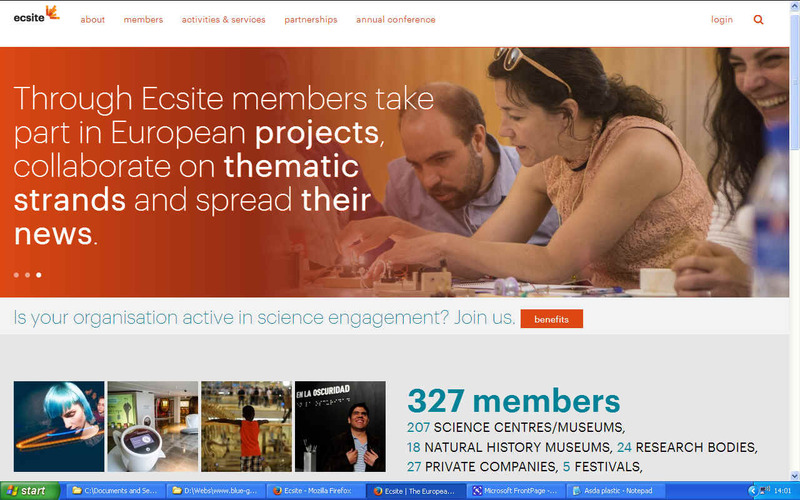 ECSITE EUROPEAN NETWORK SCIENCE CENTRES & MUSEUMS - Ecsite links science centres, science museums, natural history museums, zoos, aquaria, universities and research organizations in Europe. All Ecsite members are committed to public engagement in science through accessible, interactive exhibits and programmes. As a network, Ecsite promotes understanding of science, technology engineering and maths by facilitating cooperation among its members. In this spirit, we strengthen citizens’ engagement and interaction with science. We are the European focal point for institutions who wish to take action in the field of science communication. 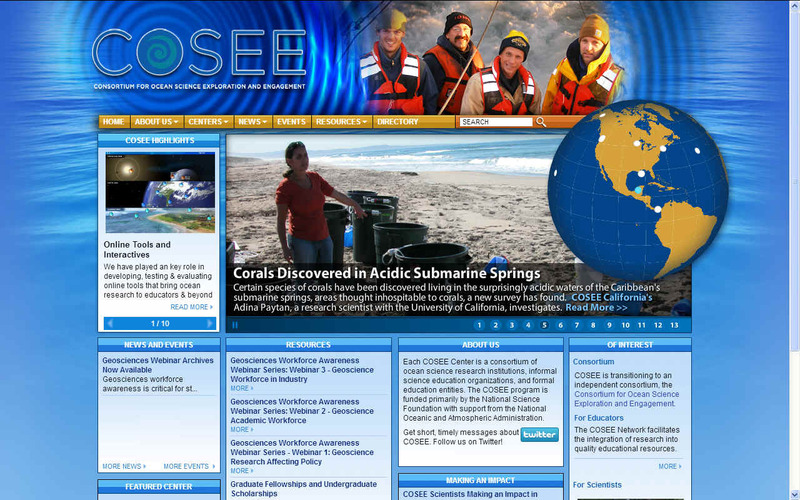 For over 25 years, Ecsite has been the European hub of science communication activities. A trusted partner of the European Commission, it has implemented a wide range of European projects, including consultation processes in science centres and museums to give feedback on European policy. 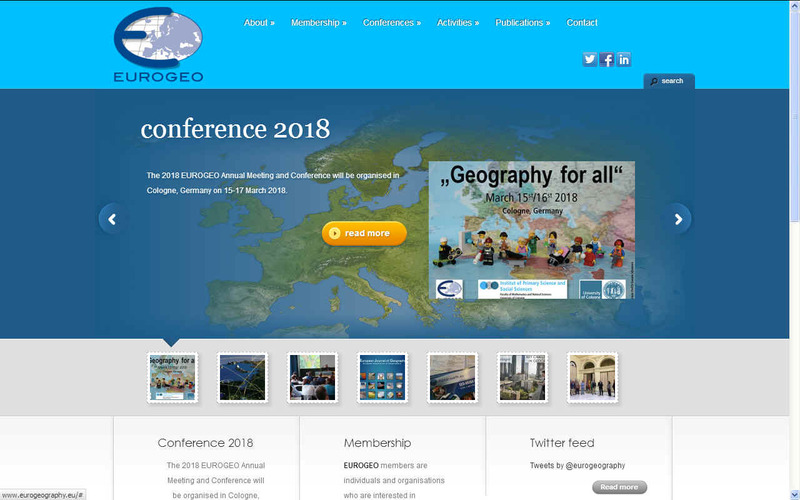 Ecsite’s broad experience in international cooperation has included a wide variety of stakeholders, from industry, to research, to policymakers, to civil society. TECHNICAL UNIVERSITY OF DENMARK - The Technical University of Denmark is ranked in the top 20 technical institutes internationally. 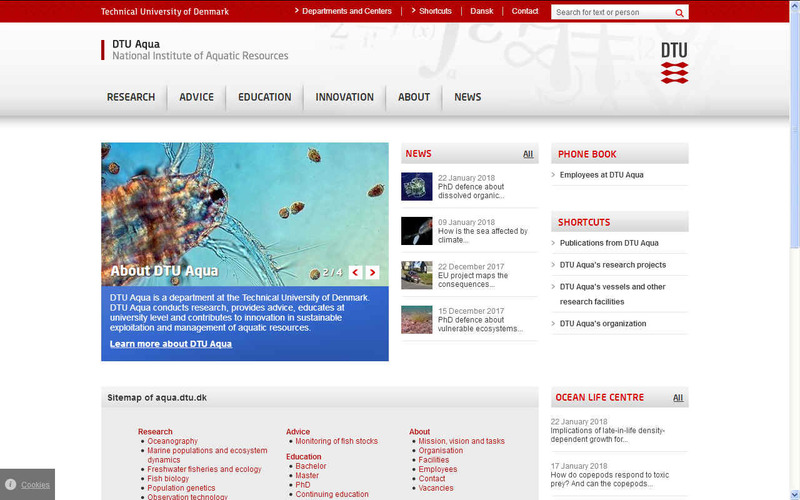 The Institute of Aquatic Resources (DTU-Aqua) has 230 staff and provides research, education and advice concerning sustainable exploitation of living marine and fresh water resources. DTU-Aqua conducts research in aquaculture, fisheries and fish stock assessment, and anthropogenic and climate impacts on the marine environment, as well as monitoring of relevance to the Marine Strategy Framework Directive (MSFD). The institute has extensive experience in coordinating and managing research programmes (FP7 FACTS, MyFISH, EURO-BASIN, as well as participation in project in support of MSFD (FP7 MEECE), engage the fishing industry on best practices (GAP & GAP2), and Marine Research strategy and education (FP7 EUROMARINE). 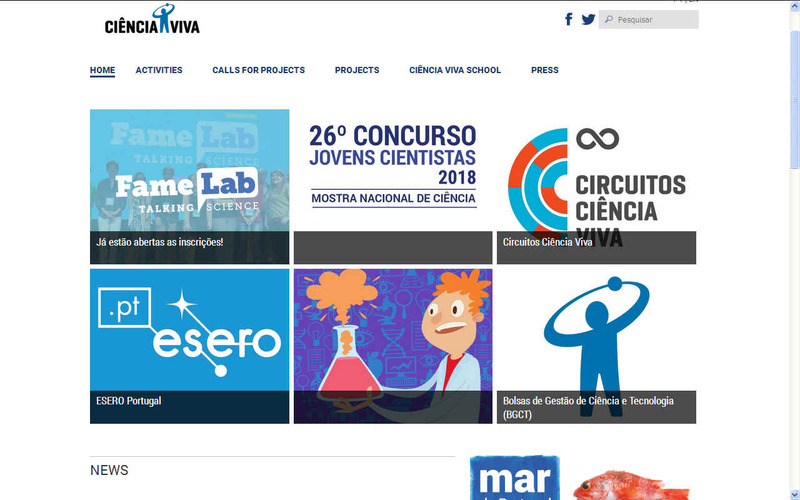 PORTUGUESE AGENCY FOR SCIENTIFIC AWARENESS & TECH CULTURES - Ciência Viva, the Portuguese National Agency for Scientific and Technological Culture, was created in 1996 to promote public awareness of the importance of science and technology at a national level. Since then it has been developing activities along three complementary streams: science education (schools), public awareness of science (citizens) and science centres (national network). The ocean has been a key area of these streams for the last years. In 2011, Ciência Viva coordinated the adaptation of the US Ocean Literacy initiative to Portugal, with the support of the Portuguese marine science and education science community. The “Knowing the Ocean” project complemented the Ocean Literacy principles and concepts with a navigation chart for K-12 schools, for easier engagement of students and teachers. Since then Ciência Viva has been a driving force on implementing Ocean Literacy in Europe, taking part in international work meetings and conferences on the subject, where it shares its national level experience. 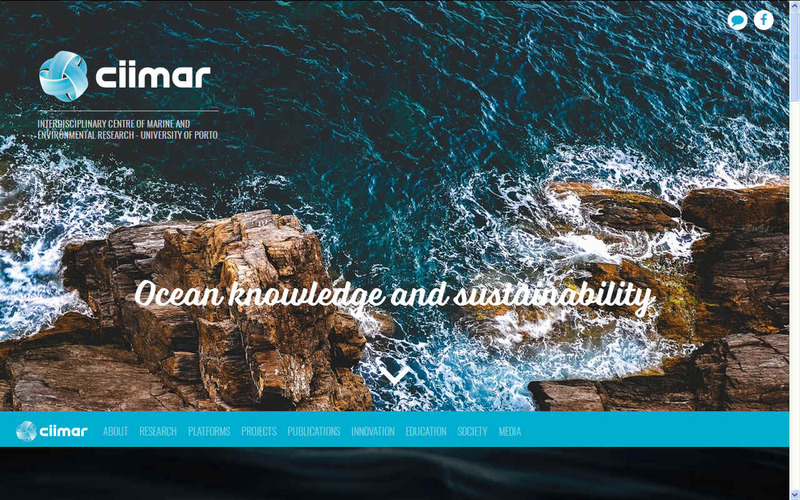 CIIMAR CENTRE MARINE ENVIRONMENTAL RESEARCH - Interdisciplinary Centre of Marine and Environmental Research - is a research and advanced training institution hosted by the University of Porto. It is a leading interdisciplinary centre for marine research that works in most of the research fields related with Ocean Health, and the societal benefits that we take from the ocean. We are also very engaged in education from teaching at University graduate and post graduate level, including science teachers training, and collaborating in several European PhD and Master programmes, including Mare. We have also several educational programs with basic and secondary schools, and outreach programs for the general public. CIIMAR supports the management of 4 science outreach centres in 4 different towns in Portugal dedicated to the dissemination of knowledge and the engagement of the public with the sea and the marine resources and activities. So this places CIIMAR in a very good position for all the tasks related with formal and informal education and engagement with schools and the general public. INTERGOVERNMENTAL OCEANOGRAPHIC COMMISSION - UNESCO's mission is to contribute to the building of peace, poverty eradication, lasting development and intercultural dialogue, with education as one of its principal activities to achieve this aim. The Organisation is committed to a holistic and humanistic vision of quality education worldwide, the realisation of everyone’s right to education, and the belief that education plays a fundamental role in human, social and economic development. UNESCO’s educational objectives are to support the achievement of Education for All (EFA); to provide global and regional leadership in education; to strengthen education systems worldwide from early childhood to the adult years; to respond to contemporary global challenges through education. As the only United Nations agency with a mandate to cover all aspects of education, UNESCO’s work encompasses educational development from preschool through to higher education, including technical and vocational education and training, non-formal education and literacy. The Organisation focuses on increasing equity and access, improving quality, and ensuring that education develops knowledge and skills in areas such as sustainable development, HIV and AIDS, human rights and gender equality. UNESCO works with governments and a wide range of partners to make education systems more effective through policy change. 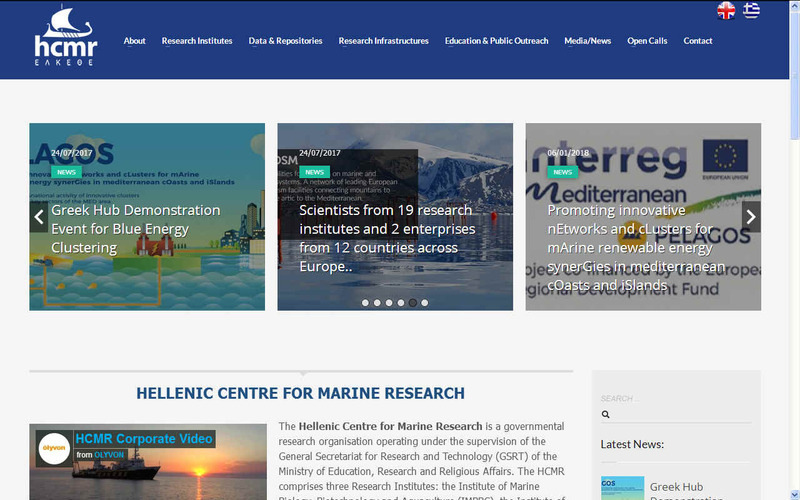 HELENIC CENTRE FOR MARINE RESEARCH - The Hellenic Centre for Marine Research (HCMR) is a governmental research organisation operating under the auspices of the General Secretariat of Research and Technology and within the Ministry of Education & Religious Affairs. It was established by government decree on June 3 2003, by the merging of the National Centre for Marine Research (NCMR) and the Institute of Marine Biology of Crete (IMBC). The Centre promotes marine research, both baseline and applied, and provides services and technical support to individuals and organizations on environmental issues, as well as in the fields of oceanography, fisheries and aquaculture. This research combination and the specialization of the scientific staff in various disciplines ensure a global, multidisciplinary approach which makes HCMR a leading establishment in aquatic environment research, with significant participation in numerous EU-funded RTD projects. 1. 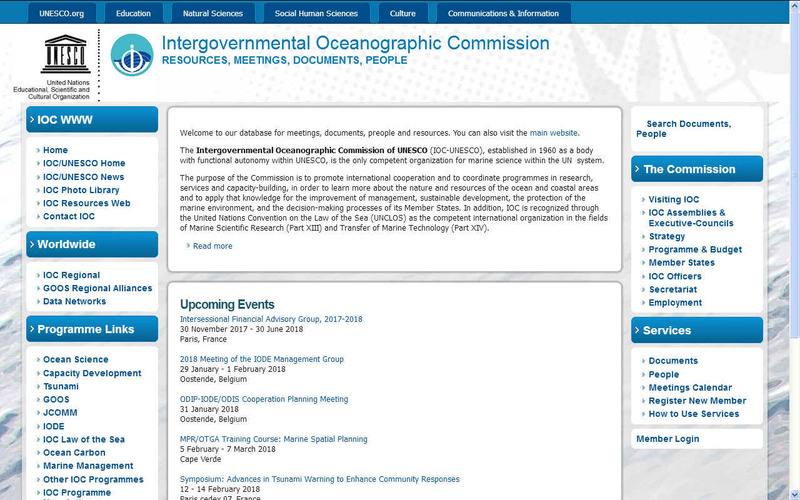 Organise and implement the online marine teaching practices seminars and workshops described in Task. 2. Support the creation of an online directory for marine education best practices to promote ocean literacy in Europe as described in Task 3.6. 3. Support the development of an online, open and easily accessible information base of existing knowledge in the broad area of Seas and Ocean Health (environmental status, pollution affecting marine biodiversity and ecosystems, ecosystem services). 4. 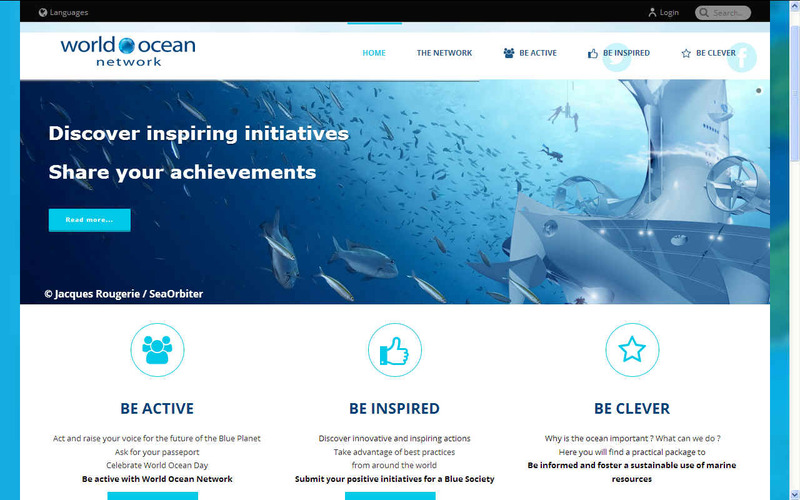 Contribute to sustainability of ocean literacy efforts beyond the time of the BG13 project by engaging foundations, business, NGOs and others in building capacity to develop an ocean literate public. 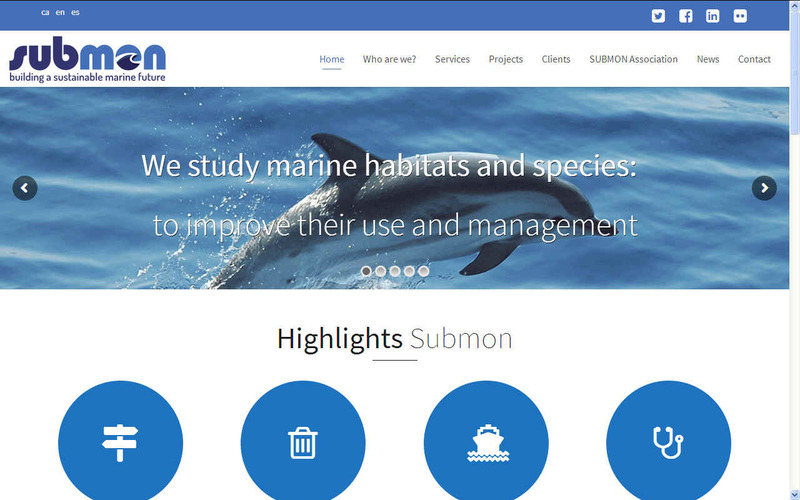 SUBMON MARINE CONSERVATION ENVIRONMENTAL SERVICES - SUBMON provides environmental services for the conservation, study and awareness of the marine environment, offering a comprehensive array in the development of projects related to the conservation and management of the marine environment. 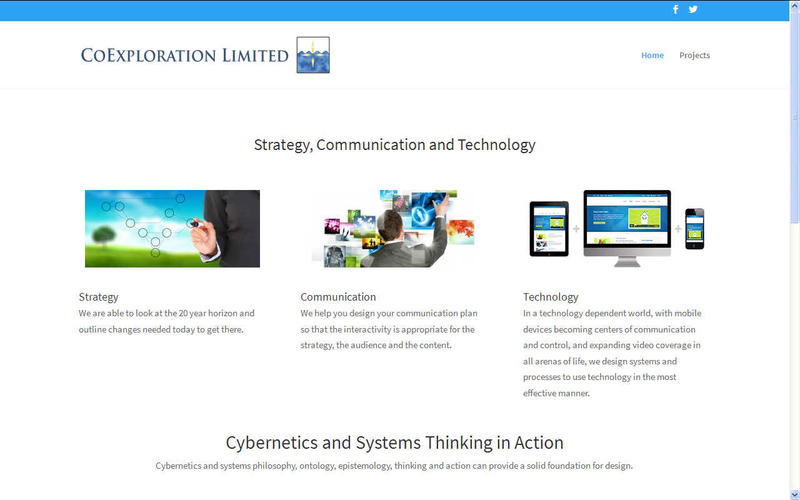 SUBMON is made up of a multidisciplinary team of specialists and professionals. SUBMON has advised and acted for different national and international public administrations, companies, research institutes and education centres, offering maximum quality in all the projects. Marine stewardship agreements are a key innovative methodology developed by SUBMON where different stakeholders (government, municipalities, local fishing companies, sailing and diving clubs) and end users of marine areas (multi-actor approach) are involved in their conservation via long term binding commitment and contribution with conservation, monitoring and management actions. SUBMON promotes the use of marine stewardship in partnership with Catalan and Spanish nature stewardship networks, and wishes to further extend this methodology across Europe. 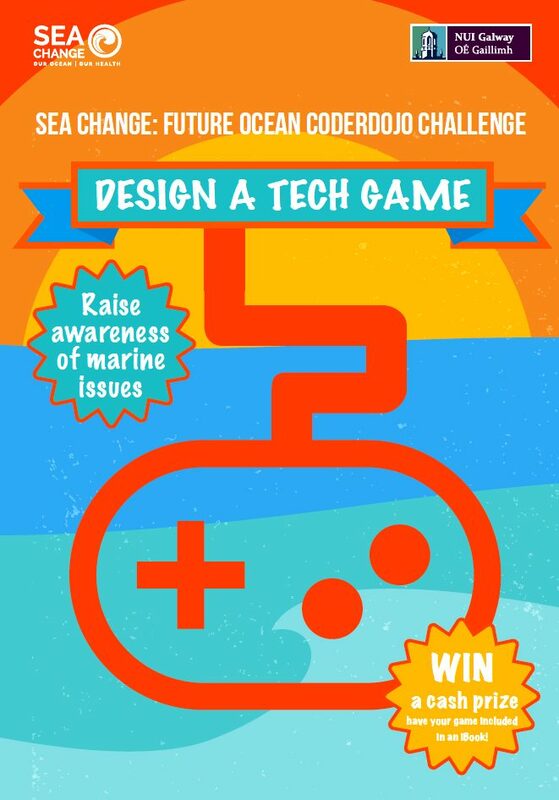 The Sea Change game design challenge was launched on 27 February 2016 and invited CoderDojo members aged 7-18 years from Galway (Ireland) to develop tech games to raise awareness of ocean issues. HORIZON 2020 - presents new opportunities for collaboration in pursuit of scientific research that will lead to lasting benefit for Europe’s citizens. AquaTT is committed to its aim of partnering in projects in order to show demonstrable value creation from research, resulting in significant contributions towards solving many of the societal challenges facing Europe. 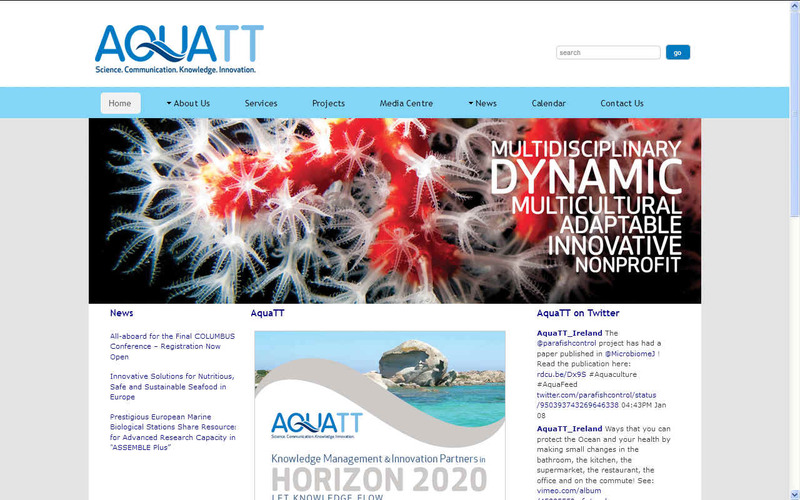 AquaTT has provided communications, dissemination, knowledge transfer, knowledge management, and project management solutions in many FP7 projects. It is currently a partner in 19 EC-funded projects across the FP7, Interreg and Lifelong Learning funding programmes. Its experienced team includes 15 staff members, with specialists in scientific research, project management, communications, training, and business development.